The peroformance will be the almost same as the original one. We must fake several things to get it done, but it will be very very close. The most annoing thing is the engine / propeller / sound model. FSX wasn't made for such small piston engines. This brings troubles similar to the aux engines of the discus glider. However it will be possible (or is actually) to cycle in a thermal or ridge, exactly as you can to in the real one. This topic showes the H36 Dimona, nothing more, nothing less. You see how long it takes to deliver ONE SIMPLE motorglider. It is not worth asking for new types while the one isn't released yet. We can talk about the other things later. Many thanks for your reply. I'm sure that developing the Dimona is taking a lot of time. It's nice to see such effort put into a product!!! With regards to the G-109 I only thought you might want to know of the customer base in the UK for it. I understand what you develop is completely up to you. but to get back to the Dimona topic: i'd like to know how long a runway must be to get it started there. would already 300m be enough, or does it need more? how much exactly? we have one HK 36 Superdimona ( i think 80 Hp Rotax) at our Airfield, the runway is ca. 800m long, our dimona needs ca.3/4 of the runway till she takes up..., i think our hk 36 would need 500 metres for take off (our runway is very bumpy at the end). think of temperature, air pressure an wind, all these factors are important for the take off length, but i dont think that you are ever able to start this lady within 300 meters. are there any new things on this? Maybe some screenshots or a video please? 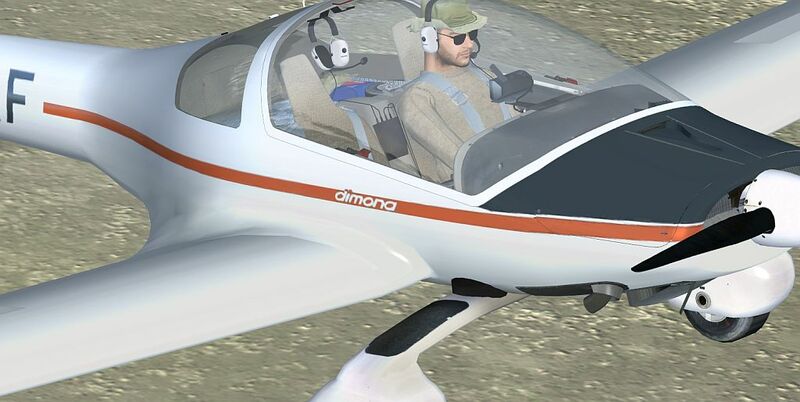 I want to fly the Dimona and that as soon as possible, so please tell me how the development goes on! LOL, yes, these questions are rather annoying, though I can understand you. in this picture you can see the working propeller control unit. It works like the real one. 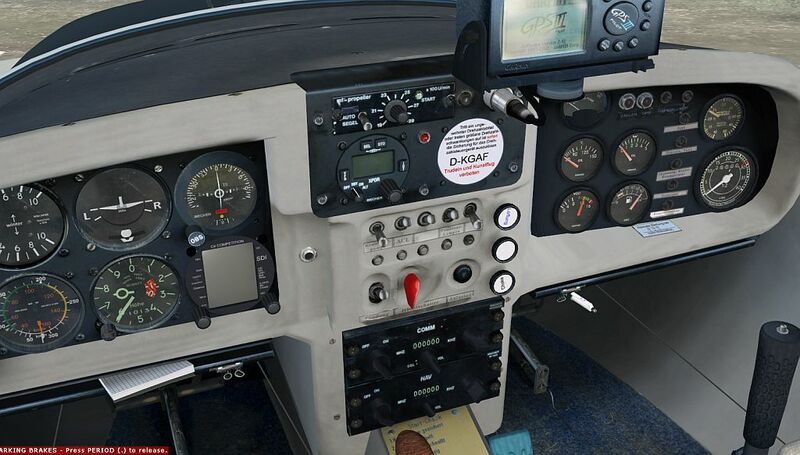 You can set the in flight RPM with the knob and feather the prop with the switch for gliding. The RPM is controlled online via prop pitch as you can see on manifold pressure. All main gauges are implemented and working now. OK...The clock, the xponder and the GPS are missing, where I am not sure how to handle this GPS. The instruments have the same characteristics as the real ones. For example the variometer showes nearly 100ft/min too much. Note that this is the glider optimized version with SDI C4 gauge. There will be a fully CVFR version as well wich contains a gyro instead of the SDIC4 for better handling on cross country flights. Awesome work Joachim I'm looking forward to this bird a lot. Don't forget to enjoy the holidays! Like many others have stated before, I would also suggest that you don't rush or start feeling pushed. 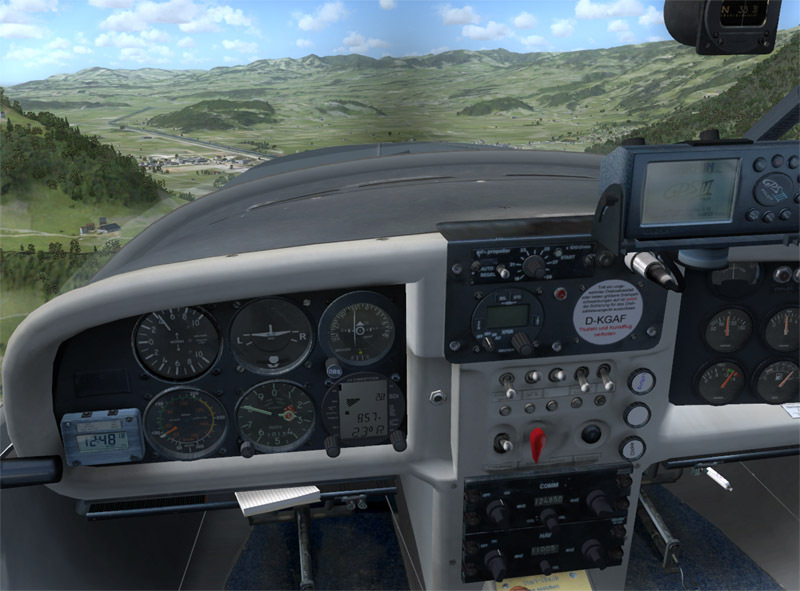 Take your time and don't forget that your family and friends are way more important than any flightsim-product. So enjoy your holidays, have a great new year's eve and take a well deserved rest. a working monochrome LCD GPS in FSX? I suppose it doesn't have an updatable database, does it? That would really be nice though! If there's one thing the FS VFR community is still missing, it's a nice Garmin GPS with an updatable database, like a 495 or even a noble 695. Or a nice touchscreen Aera 500? Imagine cruising around in your average Piper with such a shiny, fresh device... With reporting points, current CTR and airspace layout, terrain database... If someone programmed something like that and offered monthly, even half annual cycles, I'd soooo buy that! How long did it take to code that? 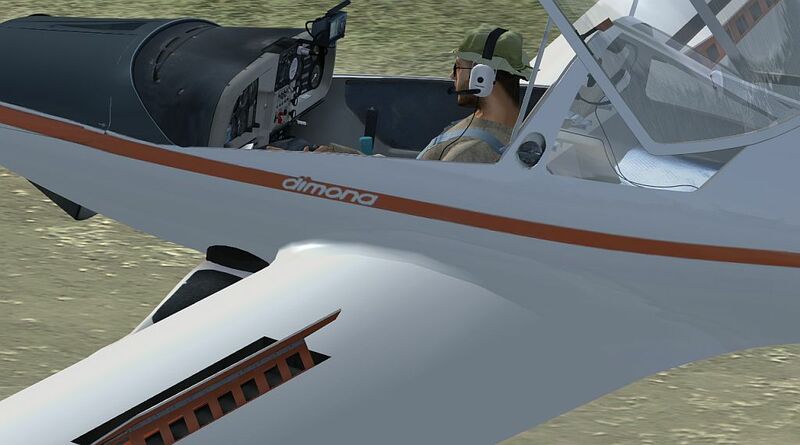 Do you really want to fly a 273nm leg with a dimona? And what is the function of the pointer if i may ask? around 11 liters per hour furel consumption. It showes where to fly if you use the GOTO funktion. Aaaand before this starts going off topic any further... Let's get back to talking about the plane. All LCD Displays are now in. The transponder works as well in all 4 states. Off (lol), stand by, on and alt. SEL, STO and IDT are inop, they are rather useless in FSX. Cool idea. I'm wondering if i can turn the GPS into every direction i want to or if there are only preselected positions. Oh and by the way, can you tell me the range of the dimona you make please? Honestly, is it something really needed? It is in the middle position when you load the plane. One click and drag and you can set it where ever you want. Thats it. In FSX you CAN calibrate the fuell consumption! (At least on planes) And it is at 15 liters@90 kts now. This is the value the manual tells. We have modeled a different prop so we will have a slightly lower fuel consumption. Calculate with at least 70 liters useable fuel and you have your range. Ok, thank you for your answers.